Now This Ain't any kind of adhesive, but its a search feature being showcased by Yahoo! for its search results. So this is another India specific feature that has been added recently after YouTube India , Hindi Transliteration, iPhone coming to India, but it can't be called an India Centric feature because Yahoo! has started its experimentation of Glue at its Indian Protal, which can be a bit strange maneuver .So what actually Glue is possibly their best attempt to win some consumer credibility when it comes to using search engines. So that was the case... No body who is habituated to google tries any other search engine regularly but when I checked it yesterday I was amazed to see that the main result page was not the classical results that wee have seen. The page was fully occupied and was broken into parts consisting of a column of regular Web Search results and along with it were Image results, some results from youtube , some sponsored results and a couple of things more. So what Actually Glue does is that it combines various search results into one and shows then onto a single page. It also shows a few related search terms onto the top, which means a better and faster search feature. But the thing is that it is not shown up for all searches but only for the searches that have more relevant data like sports,travel,entertainment,health,stocks and tech. 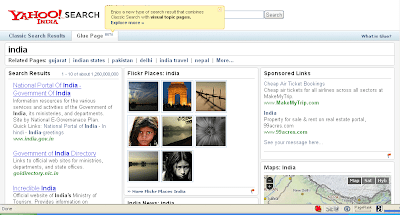 Below is the snap of the result page of term 'India' and you can clearly see Normal Search results along with Flickr and Yahoo Maps results.